Taco Bell is celebrating National Donut Day in a way only Taco Bell could. In a cryptic Tweet posted around noon today, the chain declared, "Nothing will ever be the same #CapnCrunchDelights," alongside a GIF of a pile of Cap’n Crunch's Crunch Berries and the "Delights," with "July 2nd" etched into the crumbs. 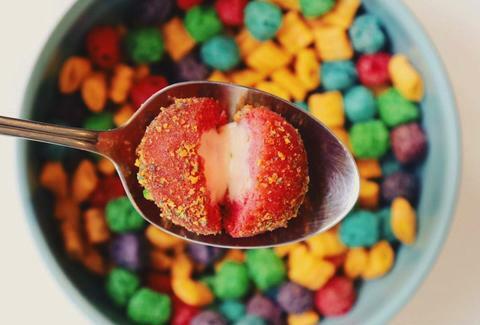 Thrillist reached out to Taco Bell, which confirmed that Cap'n Crunch Delights (currently being tested in Bakersfield, CA) will indeed be available nationally on July 2nd. The warm, fried dough ball-like pastries are coated in Cap'n Crunch's Crunch Berries cereal and filled with creamy, sweet milk icing. They'll be offered in packs of two for $1.00, four for $1.69, or 12 for $4.49. So, since cereal is involved, we can consider this a suitable breakfast food, right? Lucy Meilus is a staff writer for Thrillist and would like 1,000, please, along with a Grilled Stuft Nacho. Follow her on Twitter at @Lucymeilus and send news tips to news@thrillist.com.